When we are going to convert MP4 to audio formats for we only want audio file, we may typically think of ripping MP3 from MP4, but some users choose to extract ogg audio from MP4, Why? How to? This article will reveal advantages of Ogg audio formats, use of Ogg formats in HTML 5 and other web browsers, and recommend the best free MP4 to Ogg converters for you to make a right choice. A Solid MP4 to OGG Audio Converter is Key! 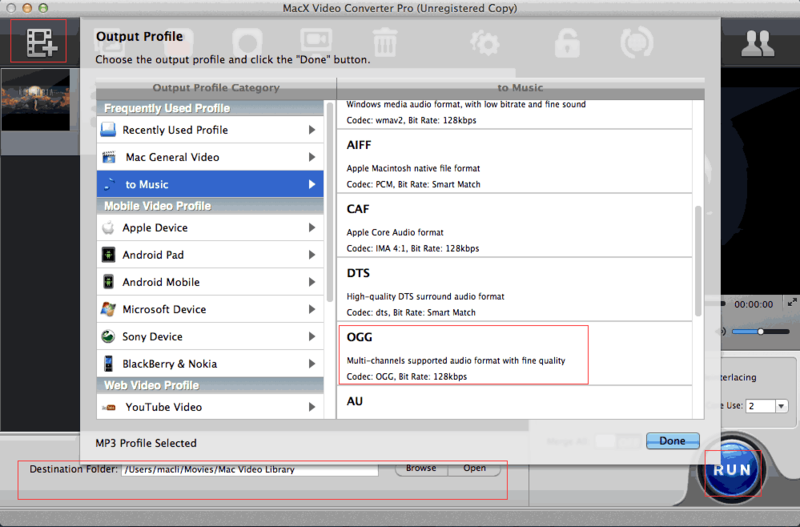 MacX Video Converter Pro provides a sure-fire solution to extract Ogg audio from MP4 files with untouched audio quality thanks to its built-in High Quality Engine. What's more, hyper-threading and multi-core (up to 8) CPU technologies guarantee you a blazing fast speed, allowing you to convert MP4 to Ogg smoothly and efficiently. Even cooler, with various audio formats supported, this audio ripper can transcode MP4 to any audio formats, say, Ogg, MP3, AAC, AC3, WAV, FLAC (loseless audio), iPhone Ringtone and more. 1. Why Choose to Convert MP4 to Ogg? Why convert MP4 to Ogg instead of MP3? At the beginning, let's have a brief look at Ogg audio format. Ogg is a free, open and lossy audio formats. With smaller file size but better sound quality, Ogg is favored by hardware manufactures and web browsers. It is even regarded as a patent-free, royalty-free version of MP3, which shows clear advantages of Ogg over MP3. Meanwhile, Ogg is used in HTML5 browser, well-known web browser are Firefox, Chrome, Opera. Notably, YouTube shows great interests in Ogg. That's why Ogg is taken into account while transcoding MP4 video to audio formats. Handbrake is a good Ogg audio ripper. It is open, free, multiplatform, multithreaded, and available for Mac OS, Windows, Linux. You can also use Handbrake to convert MP4 to AVI or other video audio formats. Its speed is acceptable, but problems like Handbrake no valid video source found, Handbrake getting stuck half way etc. may trouble you sometimes. You can also resort to VLC Media Player. VLC is able to convert among video and audio formats it supports, but some users may don't know this function. It is free, cross-platform and easy to use. 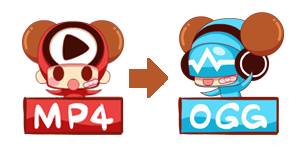 To rip ogg from video MP4 file, go to Media > Convert/Save > Add > Browse > Save. After you've chosen Ogg audio format, you can hit the settings button to adjust bitrate, channels, change the sample rate. However, VLC is hit-and-miss, common problems users may encounter are no audio after MP4 to Ogg conversion, VLC convert/save not working, VLC crashing. Step 1: Download top Ogg music extractor and run it. Import the MP4 video file by hitting "Add File" button. Step 2: Choose output format. Go to To Music > OGG > Done. Step 3: Select an output folder to save to converted MP4 file by clicking "Browse" button. Step 4: Click "RUN" button to start MP4 to Ogg conversion. This MP4 video converter also enables you to free edit MP4 video before or after MP4 to OGG conversion, including crop, trim, adding watermark, adding subtitles, etc. 1. Download YouTube videos HD, music, movies etc. to audio formats, including Ogg, MP3, AAC, DTS, WAV, FLAC, iPhone Ringtone, and many more, which means that you can download Taylor Swift new single style, Mark Ronson popular hit song Uptown Funk, etc. and convert MP4 to MP3, Ogg audio to make personalized ringtone or play on iTunes, portable devices. 2. It can convert among all video and audio formats, like MKV to AVI, VOB to MP4, MP4 to MOV, FLV to AVI, etc. for playback on iPhone 6s/Plus, iPhone SE, iPad Air 2/Mini 4, Android Samsung, to name just a few. 3. It allows you to make photo slideshow, record screen activity. Finally, if you are willing to play music on your iOS devices, you are highly suggested to transfer OGG music to iPhone iPad iPod with MacX MediaTrans. Even if your music files are not supported by iOS devices, the iOS transfer also allows you to directly change music format to MP3/AAC during the transferring process. Meanwhile, you can also take advantage of the music transfer tool to manage music files, such as adding music to iPhone, editing music details, deleting songs from iPhone, adding/deleting playlists etc.